When do the parking lots open? Parking lots open 5 hours prior to kickoff and we highly recommend arriving early. The closer it gets to kickoff, the more crowded the roadways and parking lots will become. When do the parking lots close on gameday at Arrowhead Stadium? The parking lots close 1 hour after the end of the game. What are the top things to know about parking at Arrowhead Stadium? Prepay for parking. Save money and time at the tollbooth. Arrive early. Arriving early helps you beat traffic closer to game time. Set a game plan. Review parking information to set a plan for your arrival. What is the cost of a parking pass and how do I purchase? It is highly recommended that you purchase a parking pass in advance to save time and money. Guests may either purchase a single game or a full season pass. Red Parking - $35 per game and may be purchased online by clicking here. Please note that parking fees include a Jackson County Sports Authority Parking User Fee which is waived for Jackson County taxpayers who pre-purchase season parking. For more information, please click here. How can I access my parking pass? 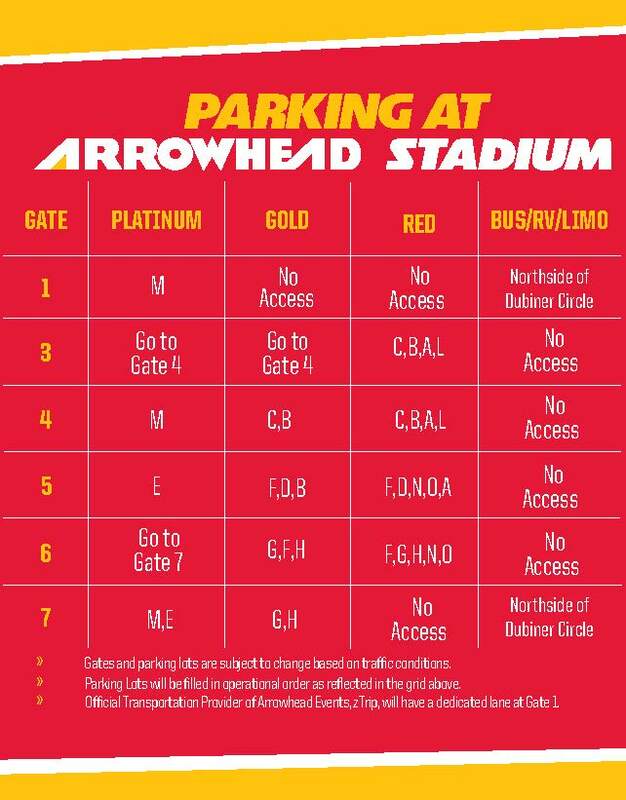 Parking passes are accessible via the Chiefs Mobile App. To learn more about how to access your parking pass and/or tickets please click here. What tips do you have for using mobile parking passes and /or tickets? Guests are encouraged to add their mobile passes to their mobile wallet for easy access on gameday. Where can I park with my parking pass? Red Parking passes are designated for Red portions of Lots A, B, C, D, F, G, H, J, L, N and O. Grass parking is permitted in limited areas around the complex. 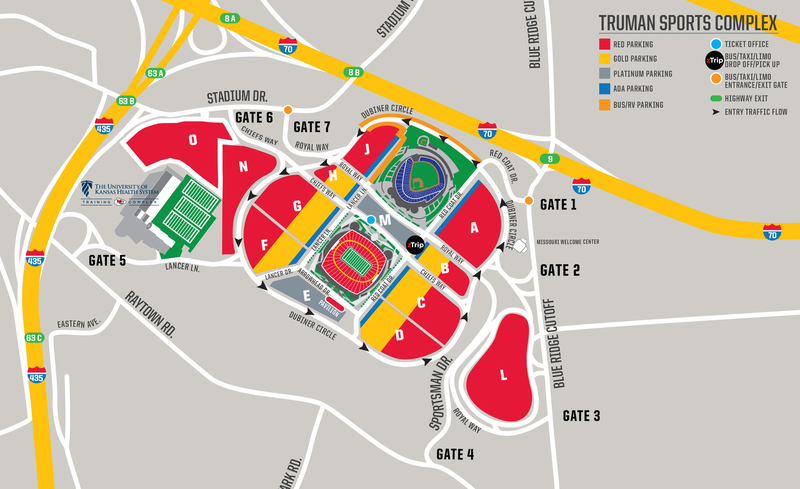 Gold Parking passes are designated for Gold lots near the front of Lots B, C, D, F, G and H.
Platinum Parking passes are lot specific for either parking in Lot M or Lot E.
Bus/RV Parking passes are designated for Bus/RV area, which is located on Lancer Lane next to Kauffman Stadium and will continue onto the right-hand side of the road of North Dubiner Circle. This lot is parked on a first-come, first serve-basis. Gates and parking lots are subject to change based on traffic conditions. Parking lots will be filled in operational order as reflected in the grid above. Official Transportation Provider of Arrowhead Events, zTrip, will have a dedicated lane at Gate 1. Can I choose my parking spot? Parking lots are filled on a first-come, first-serve basis. Spaces closest to the stadium will be filled first and will load outwards. Are there options for guests that want flexibility with their parking location? Open park will continue to be made available for the first 1 hour after parking gates open. Guests arriving during this timeframe will be directed to one of the open parking locations (Lots C, D, F, G) based on their parking pass. All approved grass parking locations will also be available during this time on a first-come first-serve basis. After the 1 hour open park is over, cars will be parked systematically. What gate should I enter to get to a desired lot? Please click here to identify which gate to enter based on our parking pass and desired parking lot. Yes, accessible parking is available on a first come, first serve basis. Guests with a valid accessible license plate or hangtag combined with a parking pass will be directed to park in an accessible parking space or the nearest parking space should an accessible space not be available. The individual to whom the accessible license plate or hang tag was issued to must be present. What services are provided for guests needing assistance to and from the parking lots? Courtesy carts are available to transport fans needing assistance within the Truman Sports Complex. Carts can be picked up at one of the many Fans First Tents located throughout the complex. Click here for a map of locations or guests can call the Chiefs Fan Experience Department at 816-920-4237 to request a cart. Please note that based on volume, wait times can vary. What are options for guests wanting to use rideshare? zTrip: Through an Arrowhead Events partnership with zTrip, Arrowhead Stadium guests have the opportunity to book a round trip ride to and from Arrowhead Stadium receiving preferred entry access via the zTrip lane at Gate 1. Guests taking the zTrip option will be dropped-off and picked-up on the east side of Arrowhead Stadium across from Lots A & B on Red Coat Drive. zTrip’s fleet includes a number of transportation options at various price ranges including local taxis, shuttles and limousines. To learn more or to book your Ztrip, click here. Uber and Lyft: Guests and non-zTrip transportation vehicles, including other ride-sharing services such as Uber and Lyft, may drop off and pick up at the Missouri Welcome Center located between Gates 1 and 2 on Blue Ridge Cutoff. To drop guests off within the complex, a non-refundable fee of $60 will be charged at the tollgate or a parking pass can be purchased in advance for $35 at www.chiefs.com/parking. Non-commercial vehicles and non-zTrip commercial transportation are allowed to enter any gate and pay the non-refundable fee, but are not allowed to use the zTrip lane at Gate 1. Once guests have been dropped off, parking personnel will direct those vehicles out through Gate 7. Please follow the direction of the traffic attendants. Bus service is available through KCATA via the 47-Broadway line. Click here to view maps and schedules. Who can I reach out if I need additional assistance?